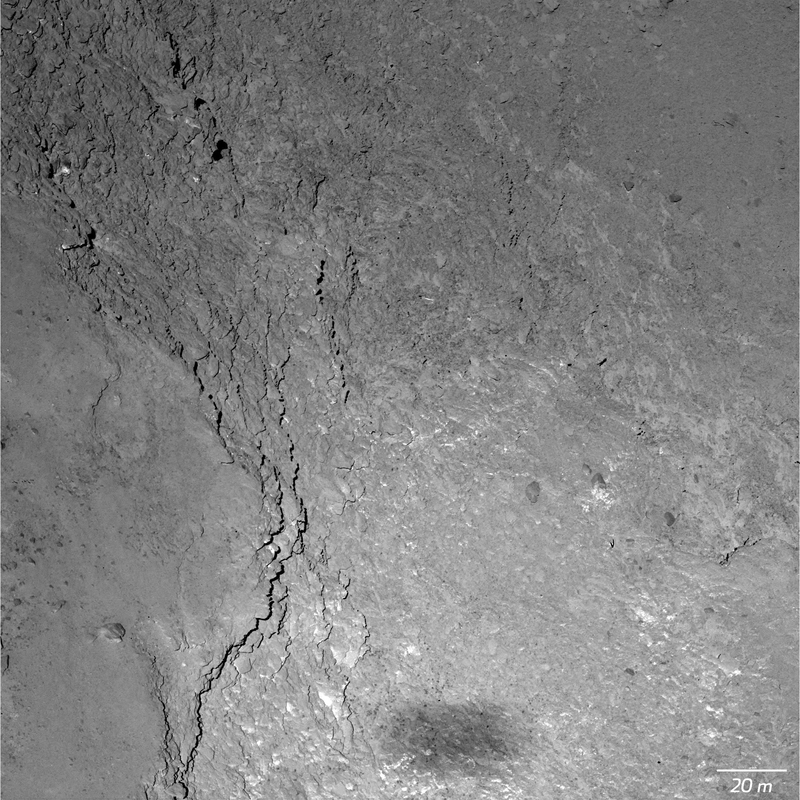 During its St Valentine’s Day flyby passing just 6 km from comet 67P’s nucleus, Rosetta’s OSIRIS-NAC narrow angle camera obtained an image with a pixel resolution of 11 cm showing the orbiter’s own shadow cast on the surface. After its flyby past the large lobe of comet 67P/Churyumov-Gerasimenko’s nucleus on 14 February, Rosetta has finished beaming back the images taken during the encounter by its OSIRIS-NAC camera. 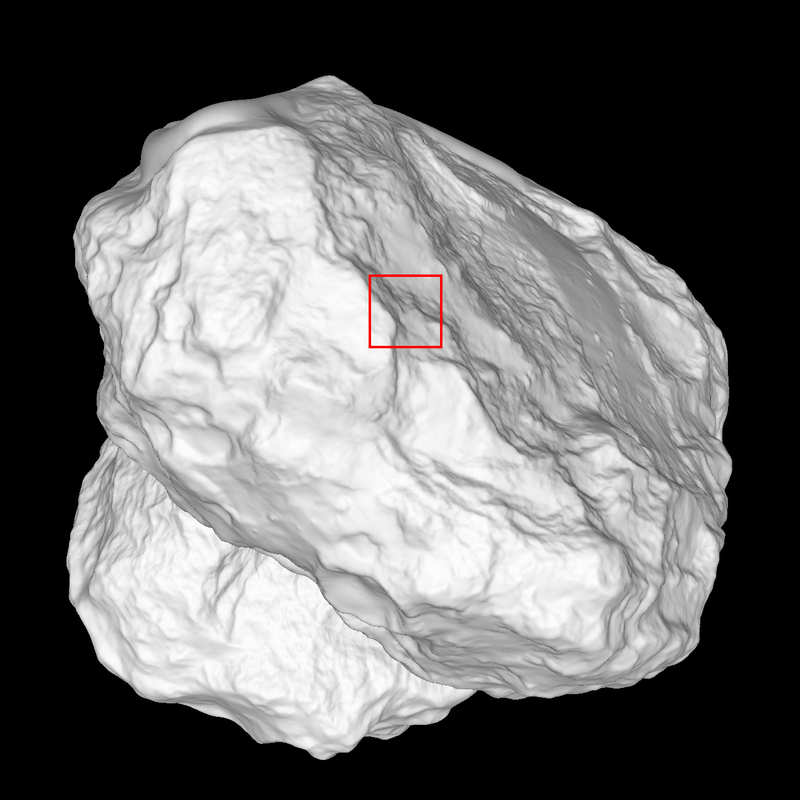 When the orbiter flew over the Imhotep region of the comet just 6,000 m overhead, the image resolution was 11 cm/pixel, the highest yet obtained by OSIRIS. The flyby trajectory had been calculated so that when the orbiter was at its closest point to the surface, the Sun, Rosetta and the nucleus were almost perfectly aligned and the orbiter cast its own shadow within the camera’s field of view. The image released today shows an area at the edge of the Imhotep region, covering 228 m x 228 m.
On the left of the image we can see steep slopes outlined by thin shadows, which then give way to smoother terrain lit by the Sun almost directly overhead. “Images taken from this viewpoint are of high scientific value, as the surface structures cast almost no shadows and therefore the reflection properties of the surface material can be discerned, which is key for the study of grain sizes,” says Holger Sierks, OSIRIS Principal Investigator from the Max Planck Institute for Solar System Research (MPS) in Germany. Illustration showing the area imaged by OSIRIS-NAC on a digital model of the nucleus. Credits: ESA/Rosetta/MPS for OSIRIS Team MPS/UPD/LAM/IAA/SSO/INTA/UPM/DASP/IDA. A fuzzy rectangular dark spot 20 m across and 50 m long is clearly visible at the bottom of the image. According to astrophysicist Philippe Lamy at the LAM astrophysics laboratory in Marseille (CNRS/Aix-Marseille University), what we see isn’t strictly speaking a shadow but rather the ‘penumbra’ of the orbiter and its massive 34-metre-span solar arrays. This is because at only 6 km from the surface, the viewing geometry is such that the orbiter doesn’t totally hide the Sun’s disc. So instead of a sharp shadow encircled by a penumbra, we see just a fuzzy penumbra. The perfect alignment of the Sun, orbiter and comet also offers a unique observing geometry for characterizing surface properties. The area surrounding Rosetta’s shadow also appears slightly brighter than the rest of the surface seen in the image. This is due to an effect known as ‘opposition surge’, previously observed on the Moon and other small bodies with highly-structured regolith surfaces. Studying this effect will help scientists to better characterize the retro-reflective properties of the dust grains in this area of the comet’s nucleus. Such an opposition surge was spectacularly highlighted on asteroid Itokawa during Japan’s Hayabusa mission. On 20 November 2005, as the probe was closing in on the surface of Itokawa, it took images of an intense opposition surge with a brighter ring encircling its shadow. As Hayabusa was only 32 m from the surface at the time, it cast a sharp shadow, unlike Rosetta in the image released today. On 20 November 2005, the shadow of Japan’s Hayabusa probe was clearly visible on the surface of asteroid Itokawa. The spacecraft was just 32 m from the surface with the Sun directly behind it, producing a spectacular opposition surge. Credits: ISAS/JAXA.